How to start organizing the Camino de Santiago? When do you want to do it? What is the best time of the year? How much time do you need to spend? How long will it take you to complete it? On foot, by bike, with your pet, on horseback. How do you prefer to go through it? What do you need to go through it? Which route best suits your needs? At bedtime, where can you rest? 🔎 How to start organizing the Camino de Santiago? Good weather arrives and tens of thousands of new pilgrims are already clear that they want to get to Santiago de Compostela this year. You want to start planning the Camino de Santiago with time to travel alone, as a couple, as a family or as a group, but you are not sure where to start. ⛅ When do you want to do it? What is the best time of the year? First of all, you must decide or agree with the other pilgrims with whom you are going to make a pilgrimage this year which month is best for all of you; Much of how to organize the Camino de Santiago depends on this. Among the regulars of the Jacobean route is unanimous: the best time to do the Camino de Santiago are the months of spring (from April to June), and the first weeks of autumn, followed by the first of summer. In winter, traveling the Camino de Santiago is hard (especially for beginners) due to bad weather and in the months of July and August, you have to live with the large crowds of pilgrims. 📅 How much time do you need to spend? How long will it take you to complete it? Fortunately, there are no written rules about the time that must be dedicated to the Camino, nor any objections about where to start or where to end (although the vast majority of pilgrims conclude their pilgrimage in Santiago de Compostela). How long does it take to do the Camino de Santiago ?, you can organize your adventure adjusting to the days you have available, either one month, 15 days or a single week, although the minimum we recommend is five days. 👣 On foot, by bike, with your pet, on horseback. How do you prefer to go through it? The choice of how to make a pilgrimage to Santiago is yours alone, but before making a decision it is important to know the official statistics. According to data from 2018, 93% of the pilgrims arrived in Santiago; by bike, 6.3% (20,787 pilgrims) and on horseback, 0.10% (310 pilgrims). You should know that in public shelters, pilgrims on foot (without a support car) have priority to obtain a place to sleep, followed by "bicigrinos". On the other hand, if you are going to do the Camino de Santiago with a dog, before you should inform yourself about which hostels allow their entry and which areas enable them to sleep, so as not to take surprises. 🎒 What do you need to go through it? Before starting to walk, as we always remember, you must carry out a physical preparation for the Camino a few weeks in advance; It is also highly recommended that you take your pilgrim's credential with some advance notice (although you can request it at the main starting points of the Jacobean routes). You will need your credential to get a place in public shelters. One of the most important tasks when it comes to organizing your pilgrimage to Santiago is to decide what to take to the Camino de Santiago in your backpack. You must follow the 10% rule (that the total weight that you carry on your back never exceeds one tenth of your weight) and carry only the essentials with you, leaving everything without accessory to avoid having to carry it during and damage your feet and your back. When you enjoy walking and discovering why there are so many pilgrims engaged in this way of life, always remember to bring water and something to eat with you; Hydration and feeding while we travel is essential to avoid unpleasant surprises. When you finish each stage, do not forget to also cultivate your spirit taking advantage of the free time to visit all the points of interest of the Camino de Santiago that you can; You will find some wonders of our heritage that you may not visit in any other way. When you finally reach Santiago de Compostela, the first thing you must do, if you have traveled at least the last 100 km of any of the Jacobean routes, is to go through the Pilgrim Attention Office to request your compostela. 🚶 Which route best suits your needs? The Camino de Santiago consists of at least five main Jacobean routes that concentrate more than 90% of the pilgrims and many other secondary (which is also worth knowing). We will focus on each of them and its advantages and disadvantages, which we will review below. 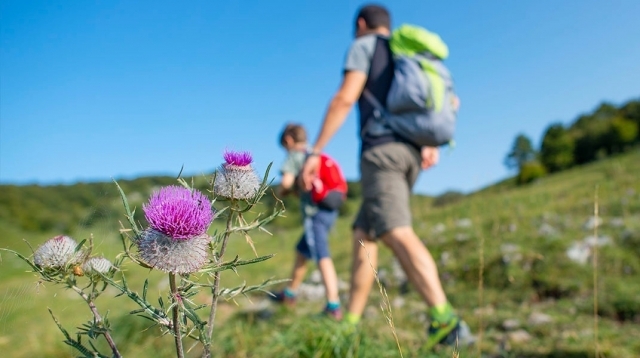 French Way (58% of the total number of pilgrims in 2018): The most popular and crowded route in the high season months. Well marked at all points, full of services for the pilgrim. Portuguese Way (21% of the total of pilgrims in 2018): Many and very good services, well signposted and less crowded than the French Way. Its last 100 km, from Tui, are the most overcrowded by far in summer. Northern Way (6% of the total of pilgrims in 2018): Route not overcrowded, which runs between the sea and the mountain, with numerous points of interest to visit. Much more demanding than the main routes and with less services for the pilgrim. It takes a lot of time to cover it in its entirety. Primitive Way (5% of the total number of pilgrims in 2018): The original route traveled by the first pilgrims from Asturias, less touristy and more authentic. Mountainous route, with many services for pilgrims and much less crowded than the French or the Portuguese (but more demanding). English Way (4% of the total of pilgrims in 2018): You can start from Ferrol or from A Coruña and it is completed in only 5 or 6 days and each time counts more more services for pilgrims. 🛏 At bedtime, where can you rest? Where to sleep on the Camino de Santiago? The Jacobean routes have a very wide network of public hostels (mainly in the localities beginning and end of stage) where you can stay economically. However, especially in high season, it may happen that when you arrive at a public hostel you find that there are no beds available (you can not book by phone in advance); in that case you will have to look for a place in private hostels or other types of accommodation, such as pensions, hostels or hotels. One way or another you will always find an option to spend the night, although it is advisable to get up early and walk early to finish your stage soon and not run out of space at the first exchange. If after having read our tips you still have doubts, take a look at these frequently asked questions about the Camino de Santiago. If you still can not find what you are looking for, leave us your questions in the comments. Information What to take in the backpack? Information When, How and Where from?